Handmade floral ribbon and bead purple cuff. 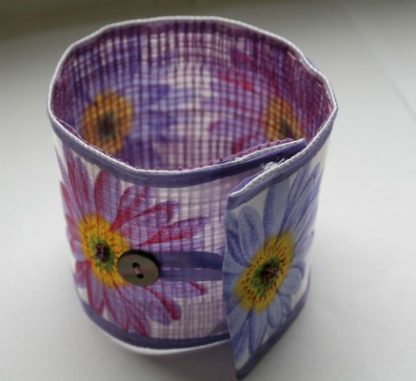 This textile bracelet is made with a piece of purple floral ribbon, hand stitched with silk ribbon edging. Purple beads attached by hand adorn the ribbon to form the centre of the flowers. 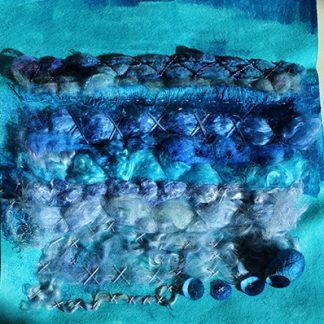 The textile jewellery piece is fastened with a silk ribbon and button. It is easy to wear and looks beautiful. It measures 25cm x 6cm unfastened (10 x just over 2″), and 22 cm (9″) when fastened. The size can be adjusted by moving the button.